Pollock died at the age of 44 in an alcohol-related single-car accident when he was driving. In December 1956, four months after his death, Pollock was given a memorial retrospective exhibition at the Museum of Modern Art(MoMA) in New York City. A larger, more comprehensive exhibition of his work was held there in 1967. In 1998 and 1999, his work was honored with large-scale retrospective exhibitions at MoMA and at The Tate in London. Paul Jackson Pollock was born in Cody, Wyoming, in 1912, the youngest of five sons. His parents, Stella May (née McClure) and LeRoy Pollock, were born and grew up in Tingley, Iowa, and were educated at Tingley High School. Pollock’s mother is interred at Tingley Cemetery, Ringgold County, Iowa. His father had been born with the surname McCoy, but took the surname of his adoptive parents, neighbors who adopted him after his own parents had died within a year of each other. Stella and LeRoy Pollock were Presbyterian; they were of Irish and Scots-Irish descent, respectively. LeRoy Pollock was a farmer and later a land surveyor for the government, moving for different jobs. Stella, proud of her family’s heritage as weavers, made and sold dresses as a teenager. In November 1912, Stella took her sons to San Diego; Jackson was just 10 months old and would never return to Cody. He subsequently grew up in Arizona and Chico, California. While living in Echo Park, California, he enrolled at Los Angeles’ Manual Arts High School, from which he was expelled. He had already been expelled in 1928 from another high school. During his early life, Pollock explored Native American culture while on surveying trips with his father. In 1930, following his older brother Charles Pollock, he moved to New York City, where they both studied under Thomas Hart Benton at the Art Students League. Benton’s rural American subject matter had little influence on Pollock’s work, but his rhythmic use of paint and his fierce independence were more lasting. In the early 1930s, Pollock spent a summer touring the Western United States together with Glen Rounds, a fellow art student, and Benton, their teacher. Pollock’s most famous paintings were made during the “drip period” between 1947 and 1950. He rocketed to fame following an August 8, 1949 four-page spread in Life magazine that asked, “Is he the greatest living painter in the United States?” At the peak of his fame, Pollock abruptly abandoned the drip style. Pollock’s work after 1951 was darker in color, including a collection painted in black on unprimed canvases. These paintings have been referred to as his ‘Black pourings’ and when he exhibited them at the Betty Parsons Gallery in New York, none of them sold. Parsons later sold one to a friend at half the price. The departure from his earlier style wasn’t what his collectors wanted. These works show Pollock attempting to find a balance between abstraction and depictions of the figure. He later returned to using color and continued with figurative elements. During this period, Pollock had moved to the Sidney Janis Gallery a more commercial gallery; the demand for his work from collectors was great. In response to this pressure, along with personal frustration, his alcoholism deepened. The two artists met while they both exhibited at the McMillen Gallery in 1942. Krasner was unfamiliar but yet intrigued with Pollock’s work and went to his apartment, unannounced, to meet him following the gallery. In October 1945, Pollock and Lee Krasner were married in a church with two witnesses present for the event. In November, they moved out of the city to the Springs area of East Hampton on the south shore of Long Island. With the help of a down-payment loan from Peggy Guggenheim, they bought a wood-frame house and barn at 830 Springs Fireplace Road. 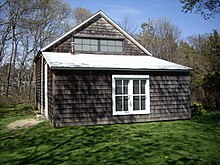 Pollock converted the barn into a studio. In that space, he perfected his big “drip” technique of working with paint, with which he would become permanently identified. When the couple found themselves free from work they enjoyed spending their time together cooking and baking, working on the house and garden, and entertaining friends. Lee Krasner’s influence on her husband’s art was something critics began to reassess by the later half of the 1960s due to the rise of feminism at the time. Krasner’s extensive knowledge and training in modern art and techniques helped her bring Pollock up to date with what contemporary art should be. Krasner was often considered to teach her husband in the dominant tenets of modernistic painting. Pollock was then able to change his style to fit a more organized and cosmopolitan genre of modern art, and Krasner became the one judge he could trust. At the beginning of the two artists’ marriage, Pollock would entrust his counterpart’s opinions on what worked and what did not in his pieces. Lee Krasner was also responsible for introducing him to many collectors, critics, and artists, including Herbert Matter, who would help further his career as an emerging artist. John Bernard Myers, a noted art dealer, was once quoted to say that “there would never have been a Jackson Pollock without a Lee Pollock”, whereas Fritz Bultman, a fellow painter, had referred to Pollock as Krasner’s “creation, her Frankenstein”, both men recognizing the immense impact Krasner had on Pollock’s career. Jackson Pollock’s influence on his wife’s, Lee Krasner’s, artwork is often discussed by art historians. Many people thought that Krasner began to reproduce and reinterpret her husband’s chaotic paint splatters in her own work.There are several accounts where Krasner intended to use her own intuition, as a way to move towards Pollock’s “I am nature” technique as a way to reproduce nature in her art. Lee Krasner’s largest challenge as an artist was to establish a separation between herself and her husband that was not strictly the otherness of a woman. In 1955, Pollock painted Scent and Search, his last two paintings. He did not paint at all in 1956, but was making sculptures at Tony Smith‘s home: constructions of wire, gauze, and plaster. Shaped by sand-casting, they have heavily textured surfaces similar to what Pollock often created in his paintings. Pollock and Krasner’s relationship began to crumble by 1956, owing to Pollock’s continuing alcoholism and infidelity involving Ruth Kligman. On August 11, 1956, at 10:15 pm, Pollock died in a single-car crash in his Oldsmobileconvertible while driving under the influence of alcohol. At the time Krasner was visiting friends in Europe and she abruptly returned on hearing the news from a friend. One of the passengers, Edith Metzger, was also killed in the accident, which occurred less than a mile from Pollock’s home. The other passenger, Ruth Kligman, an artist and Pollock’s mistress, survived. For the rest of her life, his widow Lee Krasner managed his estate and ensured that Pollock’s reputation remained strong despite changing art world trends. 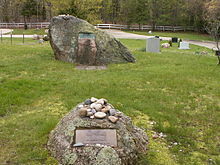 The couple are buried in Green River Cemetery in Springs with a large boulder marking his grave and a smaller one marking hers. Pollock started using synthetic resin-based paints called alkyd enamels, which at that time was a novel medium. Pollock described this use of household paints, instead of artist’s paints, as “a natural growth out of a need”. He used hardened brushes, sticks, and even basting syringes as paint applicators. Pollock’s technique of pouring and dripping paint is thought to be one of the origins of the term action painting. With this technique, Pollock was able to achieve a more immediate means of creating art, the paint now literally flowing from his chosen tool onto the canvas. By defying the convention of painting on an upright surface, he added a new dimension by being able to view and apply paint to his canvases from all directions. One definitive influence on Pollock was the work of the Ukrainian American artist Janet Sobel (1894–1968) (born Jennie Lechovsky). Peggy Guggenheim included Sobel’s work in her The Art of This Century Gallery in 1945. Jackson Pollock and art critic Clement Greenberg saw Sobel’s work there in 1946 and later Greenberg noted that Sobel was “a direct influence on Jackson Pollock’s drip painting technique.” In his essay “American-Type Painting,” Greenberg noted those works were the first of all-over painting he had seen, and said, “Pollock admitted that these pictures had made an impression on him”. While painting this way, Pollock moved away from figurative representation, and challenged the Western tradition of using easel and brush. He used the force of his whole body to paint, which was expressed on the large canvases. In 1956, Time magazine dubbed Pollock “Jack the Dripper”, due to his painting style. I continue to get further away from the usual painter’s tools such as easel, palette, brushes, etc. I prefer sticks, trowels, knives and dripping fluid paint or a heavy impasto with sand, broken glass or other foreign matter added. Jean Helion the French abstract painter on the other hand, on first seeing a ‘Pollock’ remarked ‘it filled out space going on and on because it did not have a start or end to it’. In a famous 1952 article in ARTnews, Harold Rosenberg coined the term “action painting“, and wrote that “what was to go on the canvas was not a picture but an event. The big moment came when it was decided to paint ‘just to paint’. The gesture on the canvas was a gesture of liberation from value—political, aesthetic, moral.” Many people assumed that he had modeled his “action painter” paradigm on Pollock. Clement Greenberg supported Pollock’s work on formalistic grounds. It fit well with Greenberg’s view of art history as a progressive purification in form and elimination of historical content. He considered Pollock’s work to be the best painting of its day and the culmination of the Western tradition via Cubism and Cézanne to Manet. The Congress for Cultural Freedom, an organization to promote American culture and values, backed by the CIA, sponsored exhibitions of Pollock’s work. Certain left-wing scholars, most prominently Eva Cockcroft, have argued that the U.S. government and wealthy elite embraced Pollock and abstract expressionism to place the United States in the forefront of global art and devalue socialist realism. Cockcroft wrote that Pollock became a “weapon of the Cold War“. Pollock, himself described his art as ‘motion made visible memories, arrested in space’. Pollock’s staining into raw canvas was adapted by the Color Field painters Helen Frankenthaler and Morris Louis. Frank Stella made “all-over composition” a hallmark of his works of the 1960s. The Happenings artist Allan Kaprow, sculptors Richard Serra and Eva Hesse, and many contemporary artists have retained Pollock’s emphasis on the process of creation; they were influenced by his approach to process, rather than the look of his work. In 1960, Ornette Coleman‘s album Free Jazz: A Collective Improvisation featured a Pollock painting, The White Light, as its cover artwork. In the early 1990s, three groups of movie makers were developing Pollock biographical projects, each based on a different source. The project that at first seemed most advanced was a joint venture between Barbra Streisand‘s Barwood Films and Robert De Niro‘s TriBeCa Productions (De Niro’s parents were friends of Krasner and Pollock). The script, by Christopher Cleveland, was to be based on Jeffrey Potter‘s 1985 oral biography, To a Violent Grave, a collection of reminiscences by Pollock’s friends. Streisand was to play the role of Lee Krasner, and De Niro was to portray Pollock. A second was to be based on Love Affair (1974), a memoir by Ruth Kligman, who was Pollock’s lover in the six months before his death. This was to be directed by Harold Becker, with Al Pacino playing Pollock. In September 2009, the art historian Henry Adams claimed in Smithsonian magazine that Pollock had written his name in his famous painting Mural (1943). The painting is now insured for $140 million. In 2011, the Republican Iowa State Representative Scott Raeckerintroduced a bill to force the sale of the artwork, held by the University of Iowa, to fund scholarships, but his bill created such controversy that it was quickly withdrawn. Pollock is mentioned many times throughout the 2009 play Red, by John Logan. The play’s main character, Mark Rothko, was a fellow abstract expressionist of his era. In the play, Rothko speaks to his assistant, Ken, about Pollock’s works and his death. A fictional Pollock painting is shown throughout the 2016 movie The Accountant, by Bill Dubuque. The movie’s main character, played by Ben Affleck, gains the painting through his career. He gifts it to the character played by Anna Kendrick at the end of the film. In 1973, Number 11, 1952 (also known as Blue Poles) was purchased by the Australian Whitlam government for the National Gallery of Australia for US$2 million (A$1.3 million at the time of payment). At the time, this was the highest price ever paid for a modern painting. The painting is now one of the most popular exhibits in the gallery. It was a centerpiece of the Museum of Modern Art‘s 1998 retrospective in New York, the first time the painting had been shown in America since its purchase. In November 2006, Pollock’s No. 5, 1948 became the world’s most expensive painting, when it was sold privately to an undisclosed buyer for the sum of $140,000,000. Another artist record was established in 2004, when No. 12 (1949), a medium-sized drip painting that had been shown in the United States Pavilion at the 1950 Venice Biennale, fetched $11.7 million at Christie’s, New York. In 2012, Number 28, 1951, one of the artist’s combinations of drip and brushwork in shades of silvery gray with red, yellow, and shots of blue and white, also sold at Christie’s, New York, for $20.5 million—$23 million with fees—within its estimated range of $20 million to $30 million. In 2013, Pollock’s Number 19 (1948) was sold by Christie’s for a reported $58,363,750 during an auction that ultimately reached $495 million total sales in one night which Christie’s reports as a record to date as the most expensive auction of contemporary art. In February 2016, Bloomberg News reported that Kenneth C. Griffin had purchased Jackson Pollock’s 1948 painting, Number 17A, for $200 million, from David Geffen. Untitled 1950, which the New York-based Knoedler Gallery had sold in 2007 for $17 million to Pierre Lagrange, a London hedge-fund multimillionaire, was subject to an authenticity suit before the United States District Court for the Southern District of New York. Done in the painter’s classic drip-and-splash style and signed “J. Pollock”, the modest-sized painting (15 by 281 1/2 in) was found to contain yellow paint pigments not commercially available until about 1970. The suit was settled in a confidential agreement in 2012. In 1999, physicist-artist Richard Taylor used computer analysis to show similarities between Pollock’s painted patterns and fractals (patterns that recur on multiple size scales) found in natural scenery, reflecting Pollock’s own words “I am Nature.” His research team labelled Pollock’s style Fractal Expressionism. In 2003, 24 Pollockesque paintings and drawings were found in a locker in Wainscott, New York. In 2005, The Pollock-Krasner Foundation requested a fractal analysis to be used for the first time in an authenticity dispute stirring controversy  by researchers at the University of Oregon, which identified differences between the patterns in the 6 disputed paintings analyzed and those in 14 established Pollocks. Pigment analysis of the paintings by researchers at Harvard University showed the presence in one painting of a synthetic pigment that was not patented until the 1980s, and materials in two others that were not available in Pollock’s lifetime. Subsequently, over 10 scientific groups have performed fractal analysis on over 50 of Pollock’s works. A recent study which used fractal analysis as one of its techniques achieved a 93% success rate distinguishing real from fake Pollocks.Current research of Fractal Expressionism focuses on human response to viewing fractals. Cognitive neuroscientists have shown that Pollock’s fractals induce the same stress-reduction in observers as computer-generated fractals and Nature’s fractals. Lee Krasner donated Pollock’s papers in 1983 to the Archives of American Art. They were later archived with Lee Krasner’s papers. The Archives of American Art also houses the Charles Pollock papers, which include correspondence, photographs, and other files relating to his brother Jackson Pollock. A separate organization, the Pollock-Krasner Foundation, was established in 1985. The foundation functions as the official estate for both Pollock and his widow Lee Krasner, but also, under the terms of Krasner’s will, serves “to assist individual working artists of merit with financial need”. The U.S. copyright representative for the Pollock-Krasner Foundation is the Artists Rights Society.